What was once thought inconceivable is now a reality for many countries in Europe. The nominal interest rates of many European government bonds and deposits are now negative and may stay that way for some time. Now instead of the government paying bond holders interest for lending money, the bond holders are paying the government interest for borrowing their money. This backwards world we are living in is stumping many economists who believed negative nominal interest rates were impossible. Why pay the government to spend your money when you can just hold cash? Is it logical for zero nominal interest rates to exist? However, the reality of negative nominal interest rates challenges this traditional view. Several European government bond interest rates are trading negative, although only slightly. Switzerland, Germany, Finland, the Netherlands, Denmark, Austria, Belgium, France and Sweden have all experienced negative interest rates on bonds this year. In the most extreme case, Switzerland even has negative interest rates in place for bonds with a maturity of up to 10 years. What factors are driving these nominal interest rates negative? Pessimism about the economic prospects of European countries is partially responsible for driving interest rates negative. During times of economic turmoil, investors look for safe assets to invest in even if they accept lower rates of return on investment. In this case, they may be willing to accept negative interest rates on government bonds that are considered a safe investment. Since the likelihood of government default is essentially zero, buying a government bond is a riskless asset. Considering the anemic economic growth Europe has experienced the past few years, many investors are looking for a safe asset even if they offer negative interest rates. Fear of deflation also plays a role in driving down interest rates. The inflation rate of the Eurozone area fell below zero in December 2014 and has remained low ever since. Deflation drives interest rates down since investors need less of an inflation risk premium. This could cause rates to fall below zero if the rate of deflation is lower than the nominal interest rate. Deflation also can mean trouble for the economy by driving pessimism. Lower prices reduce the amount businesses receive in sales, leading them to lay off workers and spend less in investment. The workers therefore have less money to spend which further reduces aggregate demand in a deflationary spiral. Right now this is a big problem in Europe which is suffering from low aggregate demand. Further deflation can cause more pessimism among investors who will continue to hold safe assets even at negative rates. The European Central Bank’s (ECB) asset buying program is yet another contributor to negative interest rates. 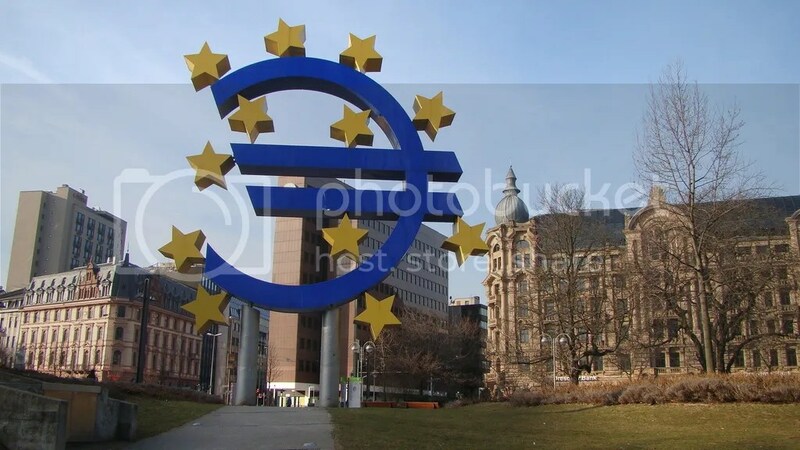 On March 9, the ECB announced a planned injection of 1.1 trillion euros into the European economy through the purchase of government bonds. Policymakers designed the program to inject much needed liquidity into the European economy to increase aggregate demand and fight off deflation. The ECB’s asset buying program also lowers the interest rate on bonds by restricting the supply of bonds. With less bonds in the market, the price of bonds rise as investors are willing to pay more to get their hands on the scarcer safe assets. As the price of bonds increase, investors are willing to accept a lower interest rate since the high price of the bond makes it less necessary to have a high interest rate to make a profit. The price of bonds can become so high that investors are willing to accept negative interest rates that will still allow them to make a profit. Even bank deposits are earning negative interest as the European Central Bank (ECB) pushed the nominal interest rate on ECB deposits negative in June of last year. This means that if banks want to hold excess cash at the ECB they will lose money. This is the first time an economy the size of the European Union has tried to use negative interest rates. The ECB hopes that negative deposits will force banks with excess reserves to loan them out to business and consumers. Europe’s economic malaise forced the ECB to take these unconventional methods to stimulate the economy. This combination of unusual circumstances is driving nominal interest rates negative. Fears of slow growth, European government policies, and investor demand for safe assets have made negative rates possible. Negative nominal rates are a sign of both economic trouble for Europe and a policy failure on the side of European central banks. The ECB kept rates too high for too long and is responding too late to the economic crisis (http://www.economist.com/news/finance-and-economics/21640371-policy-will-help-less-so-other-big-economies-better-late). As of now, negative interest rates are necessary to boost aggregate demand. However, if rates stay low for too long it can hurt banks, investors and pension holders who depend on savings for income. Fortunately, the European economy appears to be recovering. The European Commission revised its forecast from 1.3 to 1.5 percent, higher than last year’s measly 0.9 percent. The inflation rate now stands at zero percent, ending four months of deflation. All of this points to the ECB’s asset program and negative interest rates helping raise aggregate demand. While it is too early to say the European economy is out of trouble, if the economy continues to recover, negative interest rates will only be a temporary phenomenon.